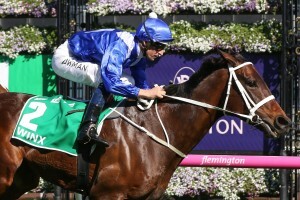 Champion mare Winx plus nine of her Chris Waller trained stablemates are included in the fourteen nominations for the 2019 Group 2 $250,000 Apollo Stakes (1400m) at Randwick on Saturday. Winx, above, is set to resume in the 2019 Apollo Stakes at Randwick. Photo by Ultimate Racing Photos. Winx will be chasing her thirtieth straight win when she kicks off her final race campaign in the Apollo Stakes with her last race day appearance scheduled to be in the Group 1 $4m Longines Queen Elizabeth Stakes (2000m) at Randwick on April 13, day two of The Championships. Possible Apollo Stakes runners from the Waller stable to take on Winx are Group 1 winners Unforgotten, Egg Tart, Patrick Erin plus Endless Drama ,Noire, Brimham Rocks, Tom Melbourne, McCreery and Performer. Trainer Pat Webster said that he is not happy for his stable star Happy Clapper to take on Winx in the Apollo Stakes but admits that the multiple Group 1 winner needs to get his 2019 Autumn Carnival campaign up and running. “I’m not happy to have to take on Winx, I’m never happy having to go up against her but ‘The Clapper’ does run well at Randwick and we have to start somewhere,’’ Webster told The Daily Telegraph. The Kris Lees trained Le Romain has been nominated for the Apollo Stakes but reports from the stable are that the six year old will continue his Autumn Carnival campaign when he runs in the Group 1 $500,000 Futurity Stakes (1400m) at Caulfield on February 23. The other two horses nominated for the Apollo Stakes are from the stables of Ciaron Maher and David Eustace, 2017 Thousand Guineas winner Aloisia and European import Mask Of Time. Betting at Ladbrokes.com.au for the Apollo Stakes has Winx at the unbackable odds of $1.10 while Happy Clapper is the closest rival in the betting at $11. Early Betting for the 2019 Apollo Stakes at Ladbrokes.com.au: $1.10 Winx, $11 Happy Clapper, $18 Le Romain, $21 Noire, Performer, $26 Unforgotten, $31 Endless Drama, $34 Aloisia, Tom Melbourne, $67 Egg Tart, Mask Of Time, McCreery, $151 Brimham Rocks, Patrick Erin.